"Wisdom" by Amy Guidry; From my New Realm series. Copyright 2008 Amy Guidry. I have completed my newest painting “Wisdom” from my New Realm series. 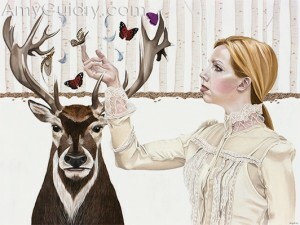 You can view the piece at http://www.amyguidry.com/wisdom.html. I have been invited to exhibit my work in “Ameri-Dreaming: Art & American Culture.” The show is scheduled for October 8- 31, 2008 in the Claypool-Young Art Gallery at Morehead State University in Morehead, KY. I will also participate in “Circus Show and Other Atrocities” this coming September. My work will be featured among 60 other invited artists from the US, UK, and Canada. The show will be held at A Bitchin’ Space in Sacramento, CA. My painting “Cedric” is now in the permanent collection of the Zigler Art Museum in Jennings, LA. “Cedric” is part of the Louisiana artists collection, which will be a traveling collection, and includes work by renowned artists Clementine Hunter and William Tolliver. The piece is from my portrait series and features local Grammy-nominated musician Cedric Watson. I was also selected for inclusion in the Art Melt 2008. The juror is Sean Ulmer, curator of the Cedar Rapids Museum of Art. The show will be held from July 11- July 22nd at the Brunner Gallery in the Shaw Center for the Arts in Baton Rouge, LA. The opening reception will be held Friday, July 11th from 6:30 to 10pm. My New Realm series will be featured at the Jennifer Marie Gallery in Las Vegas, NV. The solo exhibition will be on display this coming September. The opening reception will be Friday, September 12th, from 6-8pm. My work is featured in Volume I of the premier issue of Studio Visit Magazine. Photos of my selected paintings and information about the publication can be seen under the Press section of the Amy’s website. In addition, my work was selected for the fall edition of Studio Visit Magazine to be published this year as well. The juror was Carl Belz, Director Emeritus of The Rose Art Museum of Brandeis University. I have recently been selected for inclusion in Marquis Who’s Who of American Women. My biographical information has also been updated in Marquis Whos’ Who in the World for the upcoming 26th edition. Issue 8 of Indie Arts- The DVD Magazine features me as one of their four gallery artists. You can see more at http://www.IndieArtsDVD.com.